Local early music aficionados know that Richard Egarr is one of the most exciting conductors alive - his recent interpretations of Haydn's "Clock" Symphony and Beethoven's Eighth (at Handel and Haydn) have been nothing short of electrifying. He's the kind of conductor who somehow balances dynamic spontaneity with real intellectual rigor; he doesn't merely conjure rarefied emotional "colors;" he instills ideas in his performances. At an Egarr concert, you can often feel the whole audience on the edge of its collective seat, wondering with delighted anticipation what exactly is going to happen next, what new perspective is going to be revealed - even in pieces everyone practically knows by heart. So my hopes were high as I settled in for last week's Boston Early Music Festival evening of seventeenth-century harpsichord pieces performed by this daring musician - who got his start as, yes, a keyboardist. But is it fair or unfair to say that I was slightly disappointed, because the performance wasn't thrilling, but merely very fine? This is a problem most artists would like to have, I suppose - the problem of past achievements raising expectations to an extraordinary degree. Still, it feels mean-spirited somehow, doesn't it, to carp over quality that is merely rewarding and not as dazzling or thought-provoking as you'd hoped. Then again, it seemed odd that Egarr's conducting dazzle was often slightly lacking in his own playing, as he himself pointed out that the musical notation of the harpsichord's heyday allowed performers enormous room for improvisation. (Which is absolutely true - early music notation is sometimes so open it's reminiscent of jazz.) Perhaps there was simply something a bit constricted about several of the pieces he played, fine as they were; or perhaps Egarr gets most fired up by intellectual, as opposed to simply musical, content (they're not exactly the same thing). Indeed, I noted that when he turned to larger canvases - when he played the songs of Purcell, or limned the dense fire of Froberger - Egarr seemed to re-gain some of the edge I remembered from his conducting. Or maybe my dissatisfaction stemmed from the fact that I wasn't quite buying what Egarr was selling in his many comments from the stage (charming and companionable as these asides were). Egarr likes to point out the many similarities between the harpsichord and the lute - and don't laugh, he's quite right in many ways; both are "plucked" instruments, of course, and early music written for harpsichord looks a lot like music written for lute, with unmeasured stanzas practically free of rhythmic cues. But is a harpsichord really a giant, mechanized lute, as Egarr quipped? Somehow I don't think so. As soon as you listen to a harpsichord, you realize that comparing it to a lute is a bit like pointing out that a sax is just a brass clarinet; perhaps, but this doesn't tell you anything you really want to know. Not only is the harpsichord's timbre utterly unique - that silvery, melancholy creak that famously has been compared to skeletons dancing - but something of the nature of the keyboard (a kind of geometric abstraction) inevitably seems to manifest itself in its music. In some deep way it's just not a lute. Oh, well! 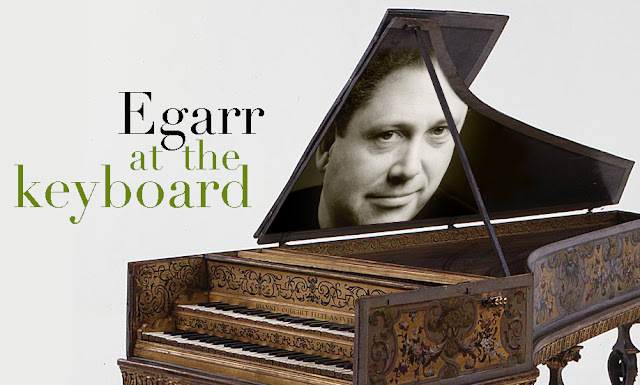 Despite all these quibbles and caveats, I must admit that Egarr is always a subtle and probing performer, whether he thinks he's playing a harpsichord or a glockenspiel. Alas, he didn't inspire in me the love he clearly feels himself for Louis Couperin (despite the solemn charms of the famous Tombeau de M. de Blancrocher, as well as the richly-wrought Chaconne that Egarr saved for last); for me, in the end, the ornamentation has gotten so encrusted in Couperin that I can't always quite scan where the ornament ends and the actual theme begins. But I was quite taken with Egarr's readings of Purcell - but then I'm always taken with Purcell; what was strange here was to discover the composer's familiar voice "singing" even in pieces such as A New Ground, which are essentially patterns of higher notes moving like lattices over patterns of lower notes (i.e., the "ground"). Even more intriguing were the pieces by Johann Jakob Froberger, a pioneer of program music who doesn't have nearly the modern profile he clearly deserves. His Toccata II in D Minor was compellingly impacted and thorny, while the grimly funny Tombeau fait à Paris sur la mort de Monsieur Blancheroche sparkled with a glints of a peculiarly sardonic sympathy. Poor Monsieur Blancheroche (whose death inspired Couperin, too) was a famous virtuoso of his day who perished after a drunken tumble down a flight of stairs. Froberger was actually present at the tragedy, but his elegy comes off as something more like a grimly ironic chuckle; it even closes with a scale that plunges head over heels down into the bass. M. Blancheroche reportedly gave up the ghost before a priest could administer last rites, so who knows where his poor spirit is lodged now - which only gives a final twist to Froberger's tumbling little joke. Ah yes - somewhere skeletons are definitely dancing to this one.